Due to the continuous pressure from a select subset of community members, misleading statements, coordinated FUD, and the active spreading of negative sentiment, we would like to address the most important points and answer the most frequently asked questions presented by the community. • Individuals and/or groups were able to manipulate the price of the COV token via strategically coordinated negative actions and the spread of FUD throughout the Telegram chat. • Ongoing cost optimization efforts have resulted in cutting many employees from our support staff, which included the moderators that helped to keep the Telegram chat organized and removed any individuals or groups that were harmful to the community. • The telegram itself was often filled with immature conversation that didn’t benefit the community, or redundant questions that would be better addressed via official statements. • Telegram itself is not the best platform for customer support, and is best addressed using our ZenDesk software and integrated live chat, or by contacting the official support@covesting.io email. Members are welcome to create unofficial groups where the project can be discussed that are void of any official Covesting presence. We stand by this decision and are confident that following a corporate communication model similar to other established companies will allow us to more directly and clearly communicate all the necessary information on product status, strategic vision, and more. Moving forward, we are happy to respond to questions, receive feedback, or bug reports though our official communication channels, but will not be engaging in harmful discussion on Telegram. All further communication will come from our official channels: the announcement channel, medium blog, and social media accounts. Covesting has always been about transparency first and foremost. No other exchange provides regular progress updates on their platform, regulatory compliance, and product milestones. Covesting chose to become one of the first-ever fully regulated cryptocurrency exchanges. While most others exchanges operate in shady jurisdictions and without any regulatory oversight, Covesting has voluntarily obtained four different licenses. Recent allegations that Covesting is a scam are not only disrespectful, but are completely unfounded and are often little more than a coordinated attack aimed at manipulating the price of the COV token. While other projects born from an ICO have simply vanished without a trace, Covesting has lived up to its promises and significantly scaled its operation to have institutional grade infrastructure. We will continue to focus our passion on building the product we set out to, and will systematically update both the community and regulators about all future milestones in a transparent manner. Most of the negatively vocal community members are disappointed with the current price of the COV token on secondary markets. However, the concept for the COV token has always been based on future utility on the Covesting platform itself, to provide a seamless trading experience with advanced features such as copy-trading. Despite the community’s requests, Covesting will not artificially increase the price of the COV token. It is against our philosophy, and would be considered illegal and unethical market manipulation. Other projects lack a working product, yet artificially pump the price of their tokens via marketing hype or by providing misleading statements to drive FOMO. We believe these underhanded strategies are unsustainable and dishonest — we simply will not follow such behavior. Nearly all cryptocurrencies, including those in the top ten, have all lost a significant amount of value. It is important to understand that these prices are driven by market conditions and negative sentiment, not due to a team or project’s development performance. Covesting remains committed and focused as ever to product development and will continue to adapt to the market. The original concept for copy-trading was to leverage API-based connections between multiple exchanges, but the tiny idea grew into a full vision and strategy to create a full-scale trading platform and operational infrastructure, complete with an in-house developed treasury, a KYC module, bank-grade back-office, internal matching engine, and much more. Covesting is already a fully-functioning, licensed exchange with multiple features, going well beyond the original Covesting concept in terms of infrastructure, regulation, scalability, and development progress. To scale a product from a simple idea into an operation such a Covesting, ample time is necessary in order to test the product thoroughly, eliminate bugs and other errors, and improve efficiency. Much of the work is on invisible back-end infrastructure that often goes unnoticed, but is the critical foundation to building a reliable and safe environment for investors. The core of copy-trading is currently under development, however, there are utility features that aren’t yet fully integrated. While many community members demand Covesting release the copy-trading module in its current state, believing that this will positively increase the market price of the COV token, there are some important points to consider regarding copy-trading to be the effective tool for traders. • Because short-selling hasn’t been implemented on the platform, copy-trading could only be released with buy-only functionality at current stage. This means traders would only be able to have “Long” position, which will reduce the possibility of profiting off trades during the falling market, and reduce the profit opportunities to followers. • Copy-trading still requires a separate approval from the GFSC due to the current license being limited to exchange services only. We firmly believe that copy-trading will best serve traders if the functionality to short-sell assets is included. However, short-selling may require additional licensing, therefore the Covesting team is hard at work experimenting with ways to develop the feature without breaching the regulatory guidelines provided by the GFSC. We are working closely with regulators to understand if short-selling can be implemented in a reasonable amount of time. Why was the Telegram switched to one-way communication? This was covered in-depth in our January in Review, as well as the first section of this bulletin. We are aiming to streamline official communication and reduce the distracting, coordinated attacks on the project and staff, keeping transparency and professionalism of communication. Absolutely not. If the project was a scam, it would not have sought to become one of the first regulated exchanges with a DLT services provider license from the GFSC. Covesting remains compliant with the principles and guidelines provided by the GFSC, and is in continuous contact with the regulator to discuss current issues, financial results, and corporate updates. Any and all allegations found in Telegram or elsewhere are unfounded lies, and are extremely disrespectful to the hard work of the Covesting staff and its loyal community. What is the financial situation of the company? The rapid decline of Ethereum prices have led to a decrease in the company’s financial resources. While some of our holdings were hedged against fiat, a large part remained in cryptocurrency, which is now approximately one-tenth the value it was back in January 2018. The reduced resources have had an adverse effect on development speed and the growth of the business. What is the plan in regards to financial resources? As would any responsible and forward-looking business, we are taking all possible steps in order to optimize costs and increase operational efficiency. Covesting is also considering external funding, equity sale, and more, but our first priority is to further optimize and reduce costs — which is both necessary and reasonable considering the current market and business cycle. What are the other issues Covesting is facing? In addition to declining Ethereum prices creating financial liquidity issues, the company is experiencing decreased demand for its services due to the current market conditions and general industry sentiment. Elsewhere in the market, exchanges are closing their doors and ceasing operations, while others simply alter their strategy to focus on survival. Every single crypto-related project or firm is faced with optimizing its cost structure toward sustainability. Another issue is the realization that the DLT license doesn’t provide the opportunities expected, necessary for rapid expansion. For example, the DLT license isn’t recognized by major advertising networks such as Facebook and Google. Whatever the issues we face, the Covesting team works tirelessly to solve them and move forward. When is the full launch? The exchange is already operational and boasts a number of features for traders. We have released an operational matching engine with internal liquidity. We provide industry-best liquidity from external providers on most digital assets. We have developed and launched a fiat-to-crypto gateway, as well as a one-of-a-kind performance tracking dashboard. Most importantly, users can exchange crypto into fiat and vice versa in a compliant and legal manner. Development is an ongoing process and we will continue to release more new features just like we have in the past, as each new feature is fully tested and implemented. Why is there a delay in the release of certain features, such as copy-trading, stop-loss, etc.? Due to the need to optimize costs across the company, multiple employees were laid off, many of which worked in development team. The lack of resources has caused delays in many of our most ambitious features, and slowed progress in general. Option 1 — We will work on a solution that allows us to introduce short-selling on the platform under the GFSC guidelines. Once short-selling has been implemented, copy-trading will be released, allowing traders to profit off of both growing and falling market prices. Option 2 — Copy-trading will be released using existing infrastructure with buy-only functionality. This option will be selected in case the additional licenses will be required to implement the short-selling which may require another 6–9 months to obtain as well as result unforeseen financial spending’s. When will COV token utility be realized? The token’s primary utility is based on copy-trading functionality, thus its utility will be tied to the implementation of the feature. The secondary utility will reduce fees for traders on the platform, however, the feature will be introduced in an upcoming platform update. 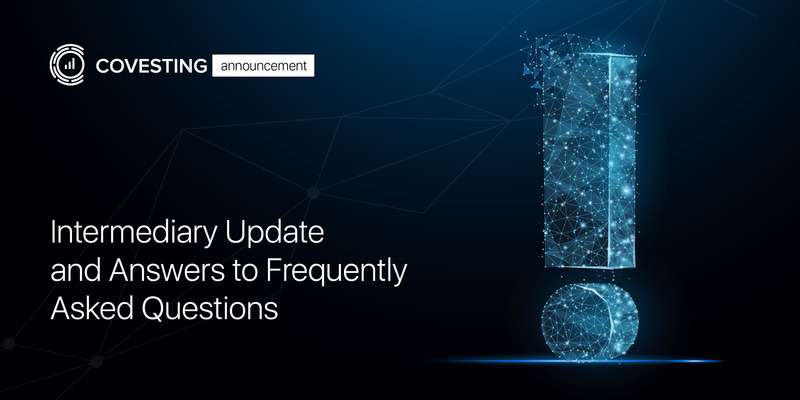 To manage expectations, no specific dates will be given, but we anticipate sharing more updates via our official communication channels during Q2 2019. When will Covesting start its marketing campaign? The current market environment doesn’t provide an acceptable return on investment. To put this into perspective and easy to understand terms, for each dollar spent on marketing cryptocurrency trading services, only about $0.10 to $0.15 profit is generated. In addition, the largest ad networks such as Google and Facebook do not accept Covesting’s DLT license, further complicating our marketing efforts. As soon as market conditions turn positive and/or ad networks begin opening up their parameters, we will revisit and review our marketing strategy. In the meantime, we are in contact with multiple projects to facilitate token listings, which we strongly believe are an effective way to reach new audiences and increase awareness without much financial investment. What are the current priorities? What is the roadmap? • Further optimize costs in order to maintain necessary financial liquidity for ongoing business operations. • Continuously test and improve existing trading infrastructure and platform. • Develop the features stated in the original white paper and introduce COV token utility into the platform. • Remain legally compliant under the supervision of regulatory authorities and remain ethically transparent to our users. • Continue to build awareness through token listings and other cost-effective methods. • Potentially consider external funding through the sale of Covesting equity. To further hammer home our message of clear, transparent communication in order to dispel the misleading FUD and encourage more constructive feedback, we would like to ask the community to send any remaining unanswered questions, provide feedback, or make suggestions by the official communication channels, such as support@covesting.io. We will do our best to provide insight into any remaining questions that weren’t already addressed here.